Sterling silver tarnishes over time. Tarnish is a blackish layer that develops when silver comes into contact with naturally occurring sulfur compounds in the air. Many people assume that sterling silver should be cleaned and polished before selling. However, this isn't always the case. In some circumstances it's better not to clean the silver at all. 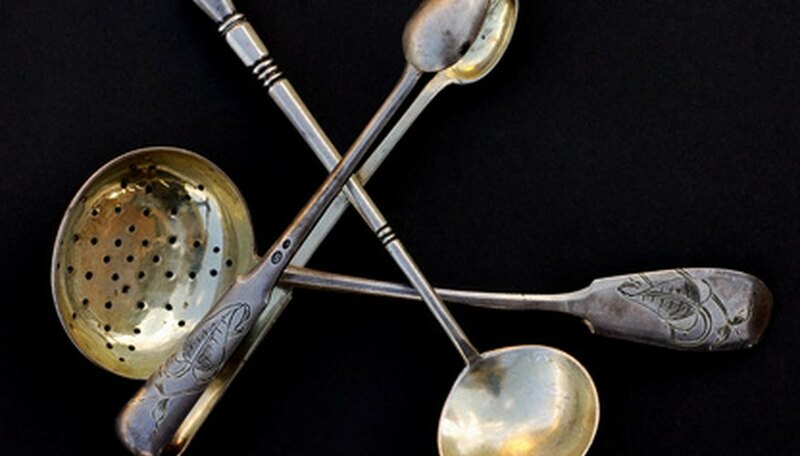 Bringing silver items to auction houses or dealers means you don't have to clean it up. Silver specialists are trained to look for key features no matter what the condition of the piece. In fact, some dealers may even be suspicious of an item if it has been overly polished and shined up. Dealers may also want to clean a piece themselves in order to avoid potential damage and scratches. Correct identification of your sterling silver items allows you to sell them for the best possible price. Hallmarks on the silver help place the date, maker and country of origin. All of these factors influence item value. Identification is easier with a clean and clear hallmark. Compare the mark to symbols and initials in a hallmark guide such as "Bradbury's book of Hallmarks". Clean sterling silver if selling online or to a private buyer. This will make any old repairs or imperfections obvious, reducing nerves or suspicion in the buyer. When listing an item online, you can also take pictures that more clearly display the hallmark and pattern detail. This is particularly useful for Internet auction sites such as eBay. You may wish to clean one area to show the surface shine. If the item is really black and tarnished use caution when cleaning in case the item is silver gilt. Anything too abrasive will take the gilt off. Silver gilt is a silver object with a thin layer of gold fixed to the surface. Use simple hot soapy water to clean light tarnish marks. Impregnated silver polishing cloths are available from hardware or antiques stores. These easily polish off light to mid-level tarnish. Heavily marked or tarnished items require wadding or a specialist silver polish such as Silvo or Goddard's. Wadding is more abrasive than cloths or cotton, so be careful of scuffing the surface by pressing too hard.